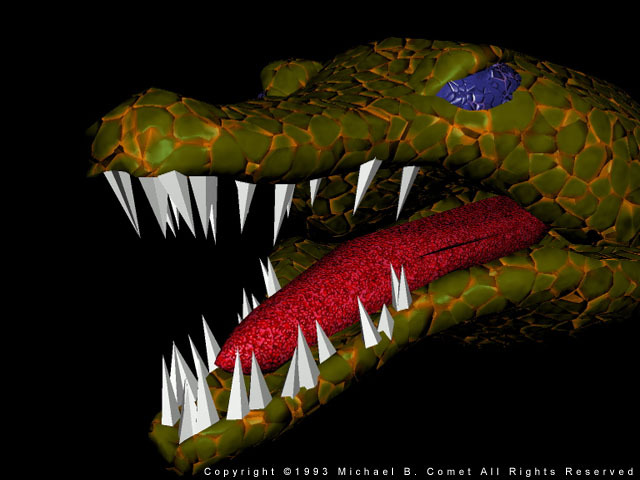 This page (which may take a bit to load) contains some of my old original 3D artwork. Some of it ranging a year or so after I started in 3D, to a little later when I had a few years under my belt, but still before I ever got my first job. Generally from 1990-1995 or so is what is here. This may be interesting if you are trying to get into the industry, as you can compare my current work, to some of this really old stuff, and perhaps that to what you yourself are doing now. 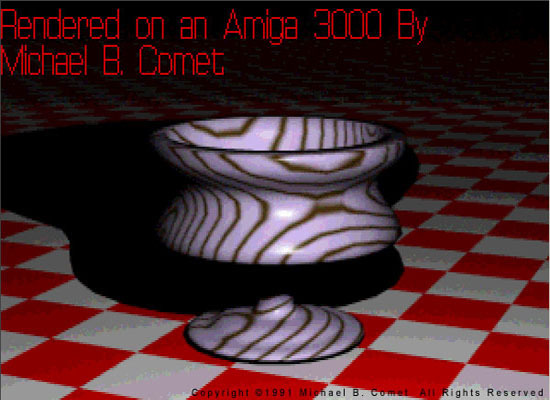 Some of it was created on an Amiga 3000 with Impulse's Imagine 3D software. At that time I think I had a 100 meg IDE drive, with 18 megs of Ram (16 basic, 2 video) and mostly worked at 320x240 with 4096 colors. 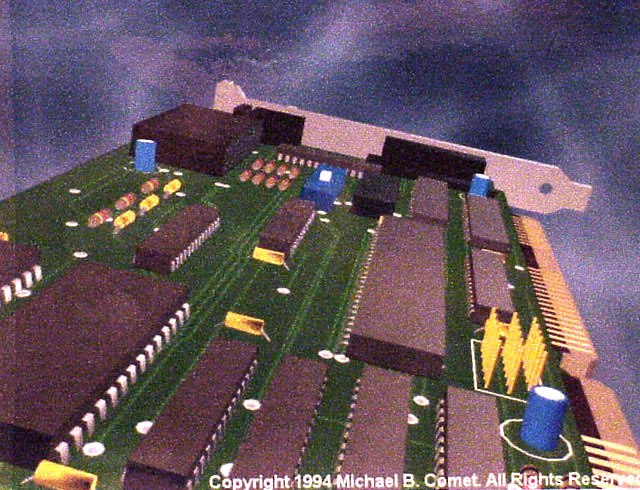 Later I bought a Firecracker24 board, and worked at higher res's like 1024x768 with True 24 bit color for still images. I used Imagine from version 1.0 all the way through 3.1 or so, when I had switched over to the PC version of the software, and off of my Amiga. Shortly after that, I started using Lightwave 3D 4 when it came out for the PC. This is about the time of the Seaquest DSV shows, and Babylon 5. A lot of the stuff from that inspired me. I pretty much used Lightwave 4 for a while, and then eventually got a job at Volition. See my About Me Page for more info on how I got started in the industry and involved in CG. 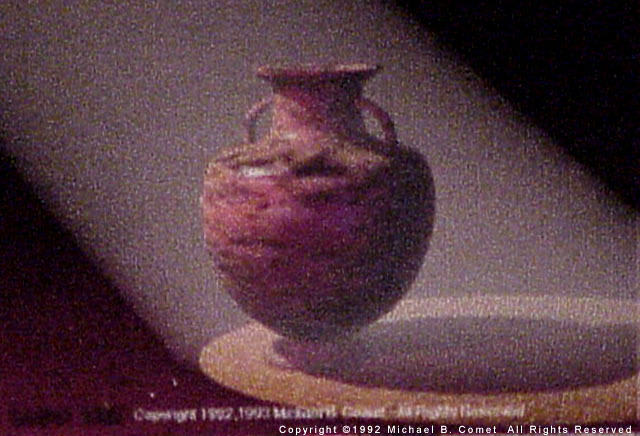 Note that most of these images are digital photos based off of old printouts I had, so the quailty/color depth is kind of poor, and most are a bit noisy. I may get some better versions of them if I can find them, and if so will update this page. Chrome Spheres Well, what old original late 80's, early 90's art gallery would be correct if it didn't start with some form of chrome spheres on a checkerboard floor? 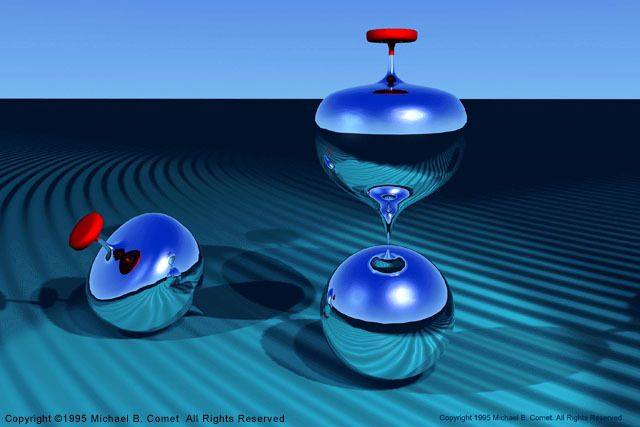 I remember thinking it was pretty cool to be able to get reflections, shadows and refractions all by 3D software... Though the shadows here are mysteriously absent. Chrome Tops 1991 This is a pretty old Image. Done using Imagine...probably from 1991-1993 sometime...I'm not exactly sure. 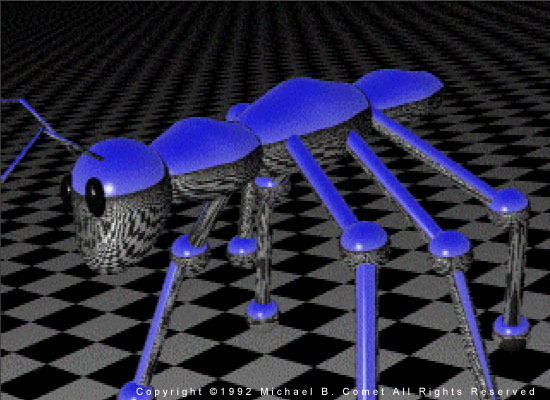 It was the good old days with chrome and ray tracing. Though at least I was smart enough not to use a checkered ground..hehe. Chrome Tops 1995 I actually liked the colors and composition of the original image so much, I redid it with Imagine later on. I'm not sure if this was one of my last Imagine versions, or if I had switched to Lightwave by this point, though I think it was still Imagine r3. Wood Bowl 1 Wow, I can lathe! Amazing modeling! 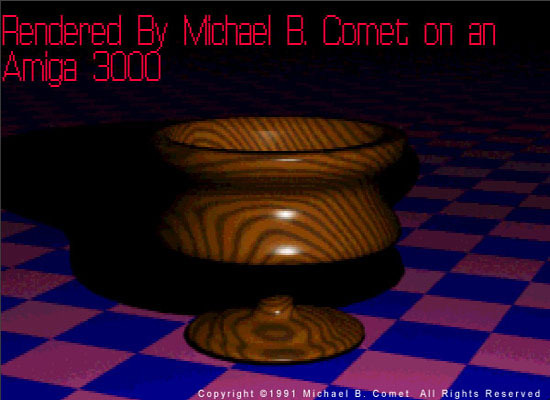 That with a nice ugly checkerboard floor, and built in procedural wood textures, this all made me a pretty basic beginning 3D artist at this stage. 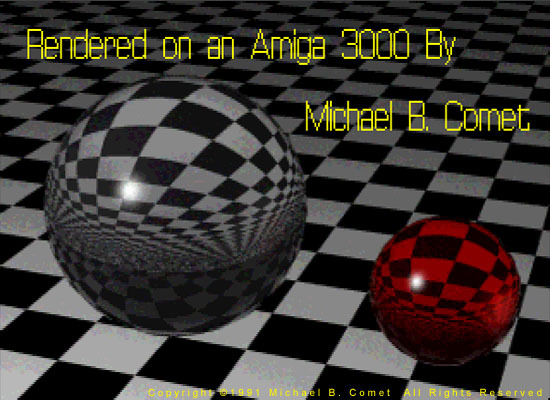 I guess I was quite proud of having an Amiga back then, as I tacked that text onto the image after it was rendered. 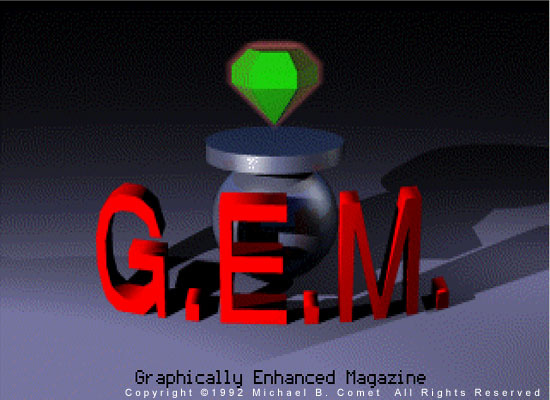 Gems Cover This was a title screen for a magazine my brother Ari and I worked on called the 'Graphically Enhanced Magazine'. I was doing a lot of C programming in my free time. I wrote my own 2D paint program and used that and my programming to write a text based magazine with custom menus and graphics in 1992. Shrine This is an old Imagine 2.0 render. 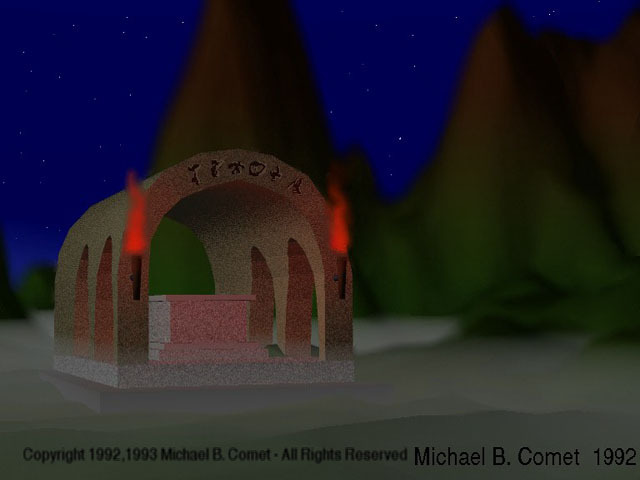 I found the readme file for it, and here is what it says: Shrine.jpg is an image of a fantasy shrine set in a valley. The image was rendered entirely in Imagine and touched up in Light 24. Background mountains were imported using VistaPro 1.0's save as Turbo Silver object function. Temple 1 This is a really simple image I did with Imagine. Pretty much basic shapes twisted or edited for this animation I did. It was a good test of basic software modeling knowledge, and for playing with lighting. I used this scene as a test when I switched over to Lightwave, and then MAX to see if I could recreate it. Temple 2 This is another angle of the temp animation I did. 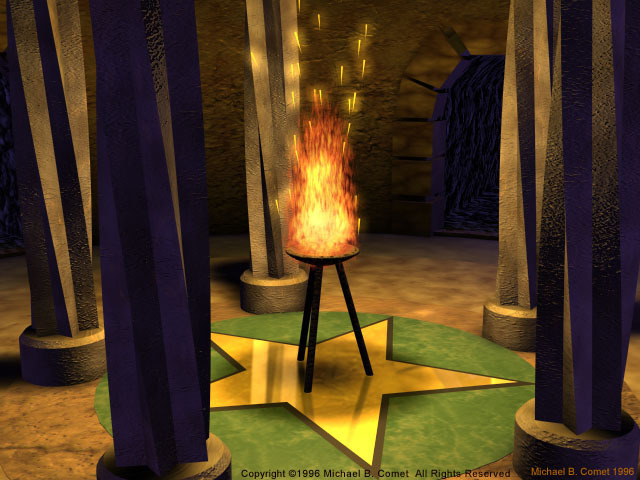 The fire was created by a simple cylinder object mapped with some fractal noise for transparency and color. Forest This image was submitted to the Imagine Mailing List contest, where it took first place in the HAM (4096 color) category. This image is a re-render in 24 bit mode. The background sky is a drawing I did with Light24 program and Firecracker24 board. 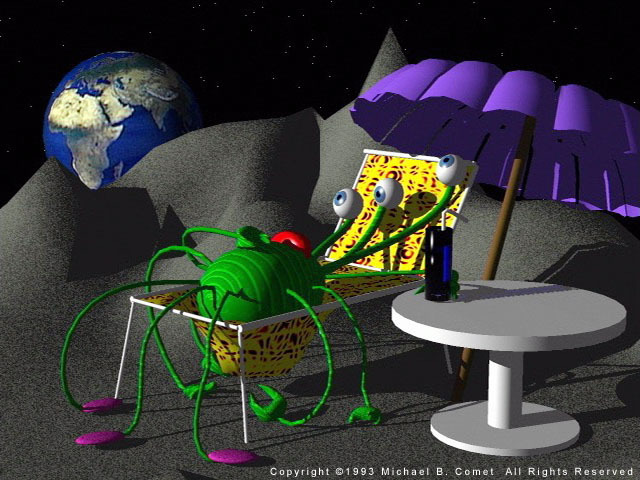 Alien Vacation This and the Bathroom image next took 2nd place for an Imagine Mailing List contest way back in 1992 or 1993 or so. 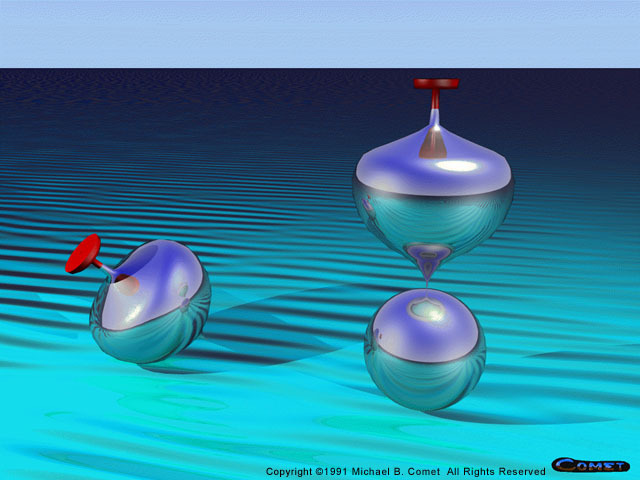 Most of the objects are obviously pretty simple, sphere for the alien, with cylinders bent into shape. And deformed planes for most of the rest of the parts. 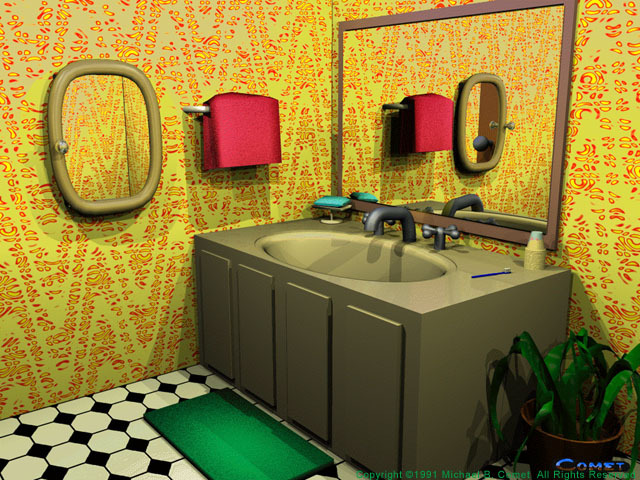 Bathroom This done with Imagine 2.0 on my Amiga 3000. This, my Alien Vacation, and some one elses entry all had a 3 way tie for 2nd place in the Imagine Mailing List Contest. I had like 10-20 lights probably to get the effect, most Ray Traced since that was the only way to get shadows. Dragon 1 This is one of the few actual 'characters' I did back in the old Imagine 2.0 days. Created with Imagines 'Form Editor', which basically was just 'lofting, or skinning'. 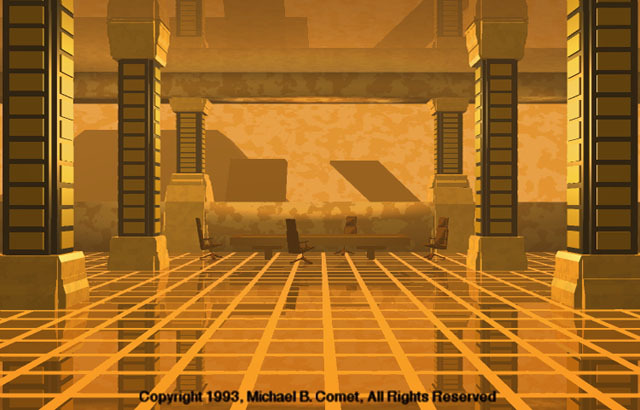 It was textured with Steve Worleys 'Essence Textures II', which were the best 3D procedural textures. Dragon 2 The full body of the character, obviously just simple shapes parented to each other. I had an animation I did with this where the wings basically rotated through the body, and it landed. Indeed it was pretty poor animation. The wings literally just rotated back and forth with no smoothness. Bladerunner One of my favorite Ray Traces... though I can't take full credit. 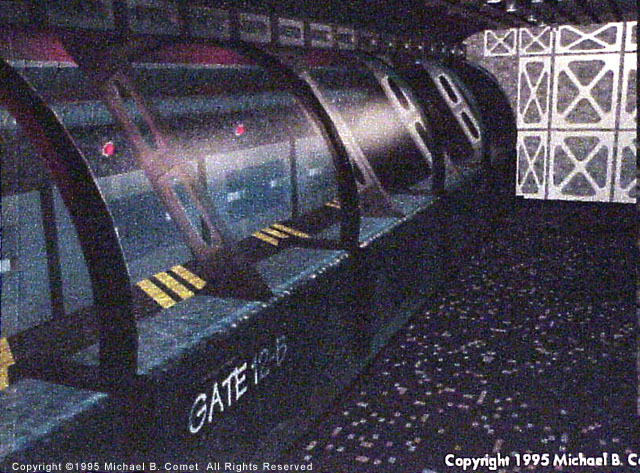 Not only is the image based off of the movie, but mine was actually a copy of another 3D artists rendering that I found in the gallery of a Lightwave magazine. I would look at other artists work and try to copy to learn how to create my own work in Imagine. Cable Truck Another 'study' image based off of a model from another 3D artist featured in the old LW magazine...someone who eventually was working at Will Vinton, though I forgot his name. The purpose of this again was because when I saw his image I was like 'Wow! Can I do that?'. So I looked at it and broke it down, and tried. 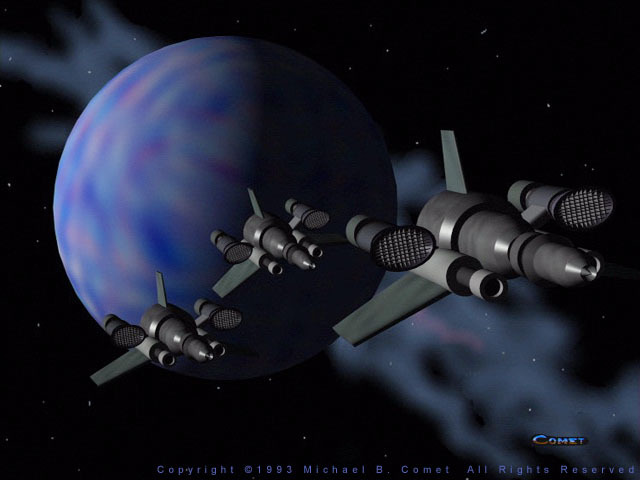 Space Fighter Inspired around 1993 by Babylon 5 and some of the Lightwave work by 3D artists at that time, I tried creating some of my own spaceships. 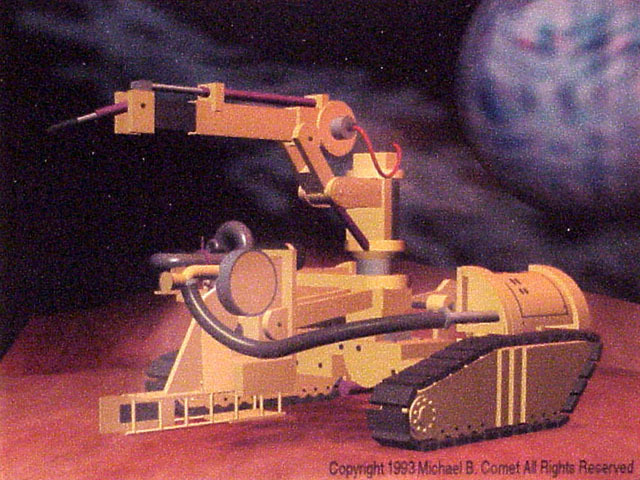 My modeling skills were still pretty bad, as were some of my texturing ability, so this is what I did. 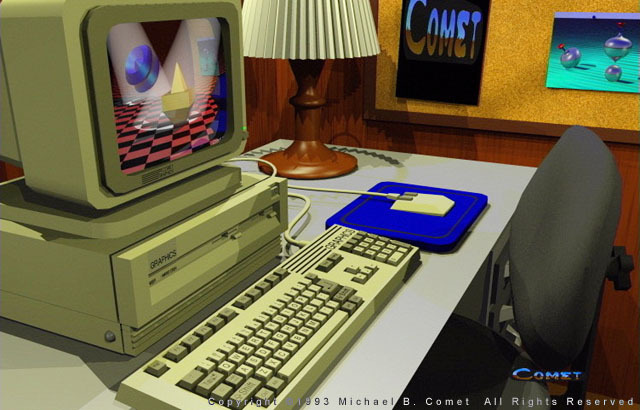 Amiga Computer A rendering and model I did of my old Amiga 3000. 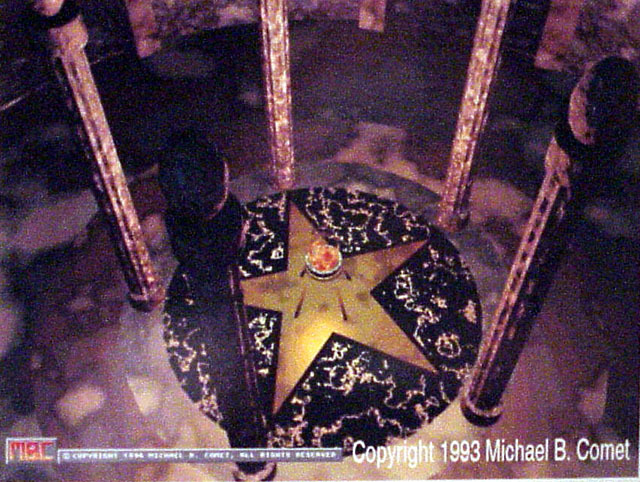 This was created on the Amiga back in probably 1992 or 1993. I mapped each key with a separate letter imagemap, which at that time seemed pretty cool, and intensive. 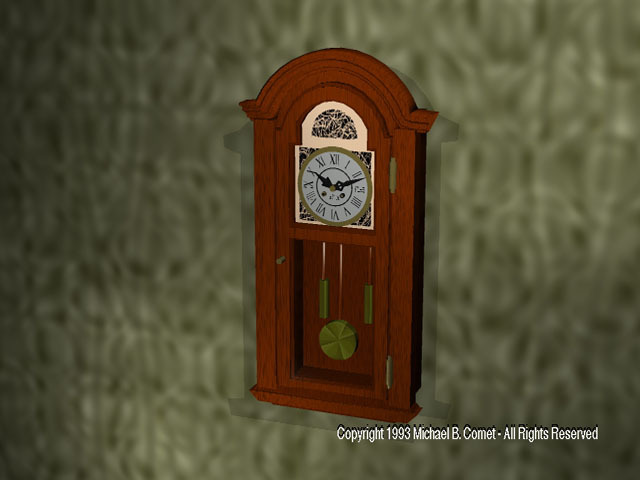 Chime Clock Here once again I was practicing by looking at a picture of a real object, and trying to see if I could model it. I was getting a bit better with understanding the modeling tools, and texturing, and how to get them to do what I wanted, and how to break down objects so they could be built in 3D. 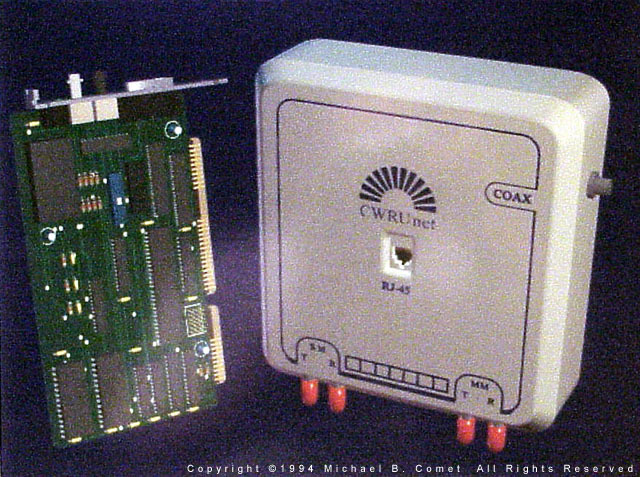 Ethernet Card This was part of an animation I did for fun when I was working as a software engineer at Case Western Reserve University's network department. The card basically flew around and a laser shot out which then caused the logo for the school to appear. Ethernet Box This is another rendering of the card, and the faceplate that was on the wall of all of the schools dorms to allow the card to be plugged in. Created with Imagine PC 3.0. By this point my modeling of more engineered type shapes had improved significantly. Sci-Fi Hall While I was working at CWRU doing network programing, I ran into some people in another department who were working to create a SciFi CDROM magazine with Director. I think it was Director 3 or 4 at that time. After talking to them, we decided I would be able to help out by creating all the artwork for the interface for the magazine. Sci-Fi Hall 2 This is a more complete version of the train hall from a different angle. I never did end up modeling the train in it. 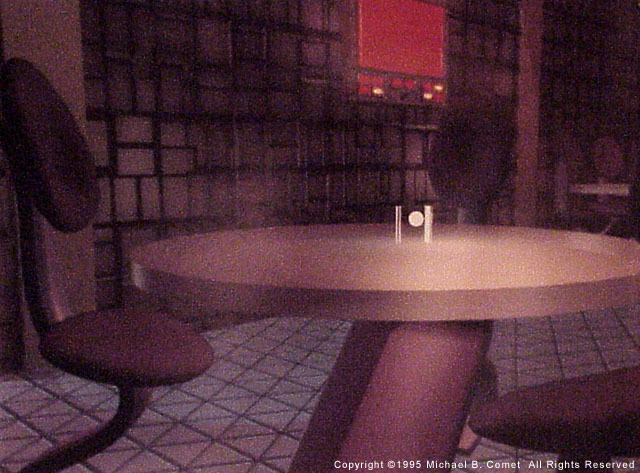 Sci-Fi Diner Closeup of a dining area I did for the SciFi CDROM magazine. The red screen in the background was related to an original interface I had designed, that the CD was supposed to use. The idea being that there would be hotspots that would take you to the interface to get to the real content of the magazine. Kind of like "Myst". Sci-Fi Composite These are some more shots of the diner area. All of this was created with Imagine and the PC version of the software. If I recall, this was actually one of the first projects where I switched to the PC version. 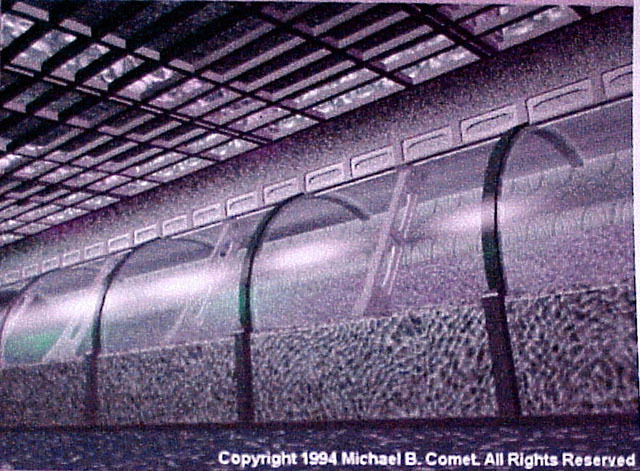 With the train hall being modeled originally on the Amiga, and then transferred and finished on the PC side. Sci-Fi Menu This was part of the main interface for the magazine. 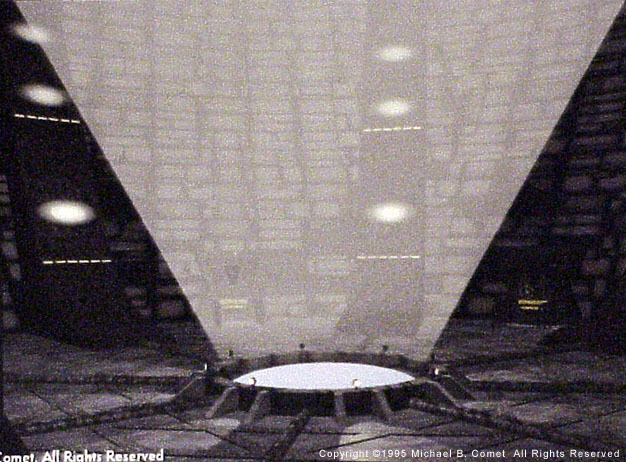 Text for each article was actually placed in the light beam, and was used to control what you picked. Most of the textures relied on the Essence Textures by Steve Worley again. 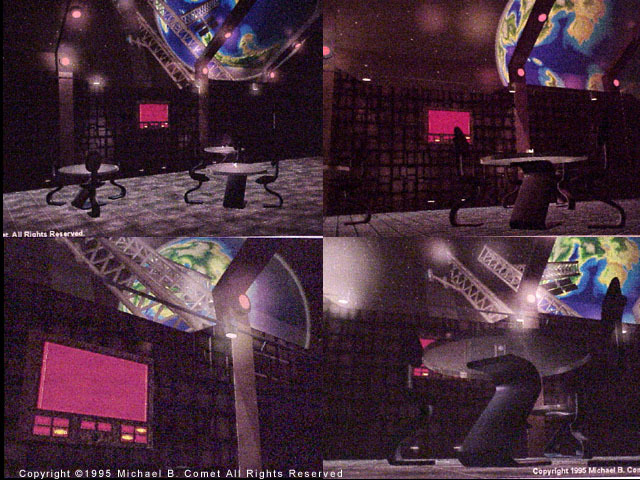 For example the paneling on the background was all done procedurally. 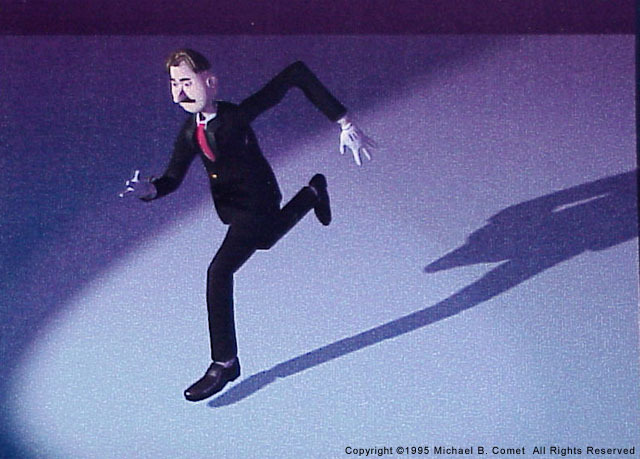 Fred This was a character I modeled for Doug Kelly to do his short with. 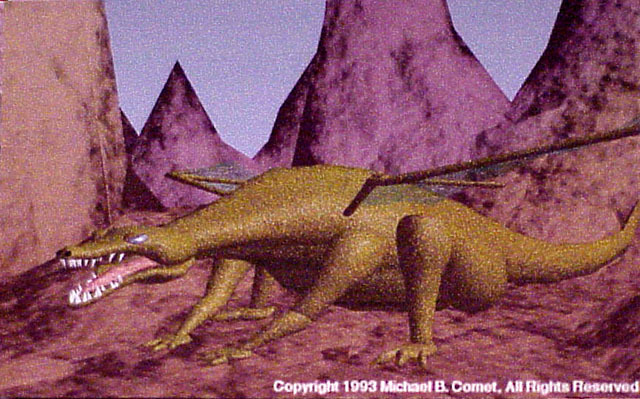 It was also used in his Lightwave 3D 5 Character Animation book. 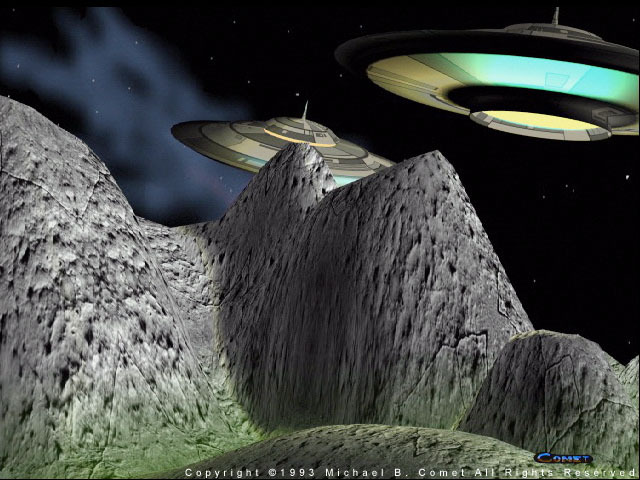 It was created mostly in Lightwave 4.0 PC. 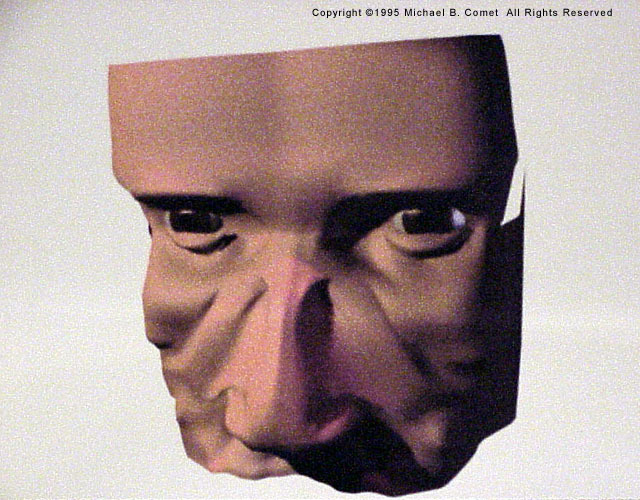 Even then, my organic modeling wasn't too perfect. 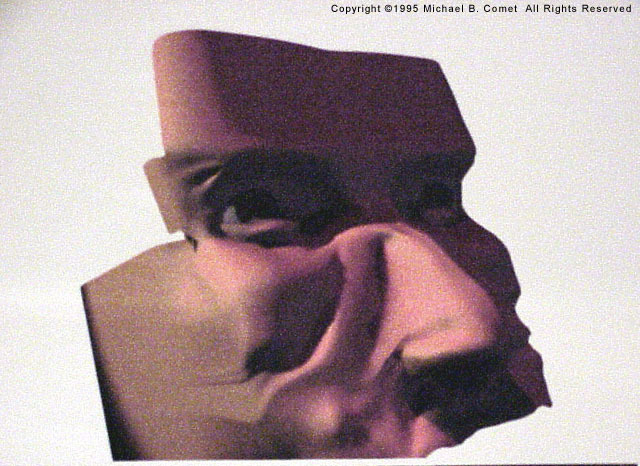 You didn't have anything like Meshsmooth/Metanurbs/Subdivision Surfaces at that time. 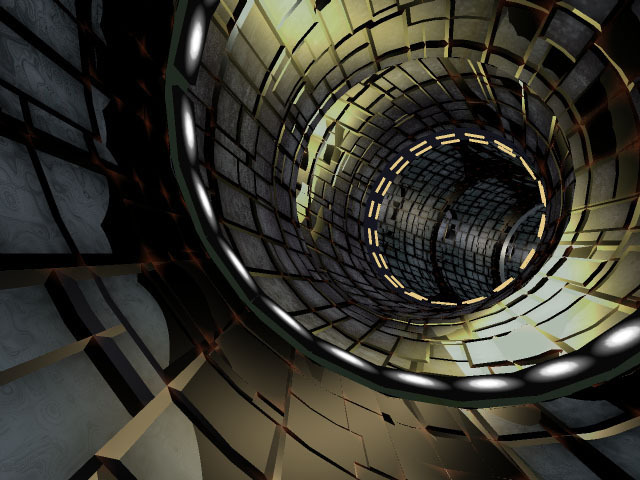 Tunnel Almost as bad as chrome spheres, animated tunnels are another "no-no" nowadays in CG animation. This one though actually garnered interest from Blue Sky back when I applied in 1995. I guess they liked the specular mapping and lighting, though most of the textures were done with basic procedural Essence tile textures. Mike Head 1 After doing a simple head for the Fred model above, I decided to try to figure out how to do a more realistic type model in Lightwave 4.0. I ended up finding the only way, was pretty much to take a basic model and deform it, or weld points etc... There weren't really any "cutting or slicing" type tools back then. Mike Head 2 This model was basically started (and never finished) by taking primitve flat square/plane objects, and welding them together, and then deforming each individual point by hand to get the shape. I would take what I had, add another basic plane object, with 8-10 sections, and weld the parts together, and then keep moving points. 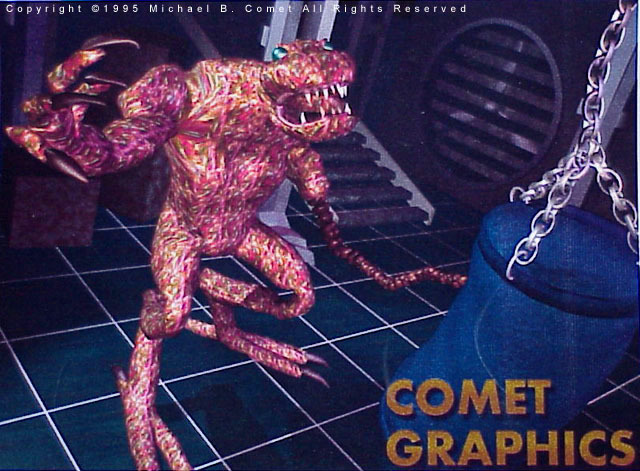 Mutant This was a character I created in 1995 with Lightwave 4.0 for a PC video game. It was a freelance job I did from home, which I never got paid for, since the game never got published. I knew that might happen, but decided to help out since it gave me a bit of experience. I actually ended up animating a number of actions and making sprites. 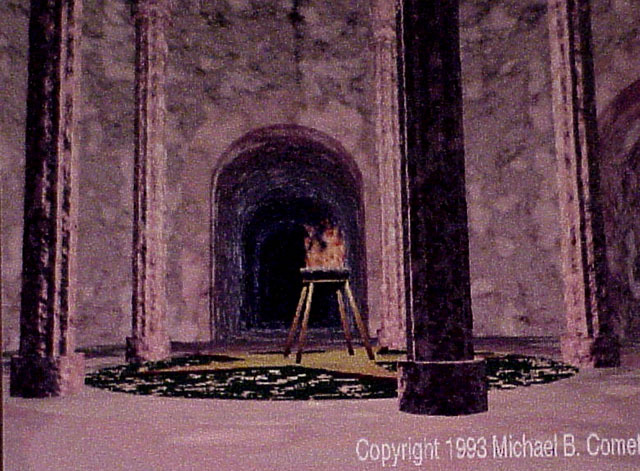 Temple 1996 This is a temple image I did. I found the response I did in the first version with Imagine so strong, I recreated it in each program I learned after that, including Lightwave 4, and 3D Studio MAX r1.2. Because it's very simple, it was a good way for me to learn the basics of the program.